The UC Davis Conference Center is on the east side of the campus within an easy walk to the UC Davis Arboretum and downtown Davis, with parking nearby. It is an attractive and spacious facility with amenities that include wireless internet. For more information visit the Conference Center website, or view the location of the Conference Center on the interactive UC Davis campus map. You'll also enjoy a visit to the exciting and interactive UC Davis Welcome Center, located right next to the Conference Center. 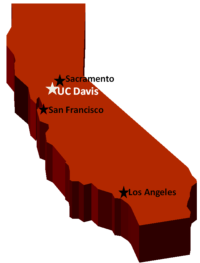 The University of California, Davis is located in the Central Valley of California, 15 miles west of the state’s capital in Sacramento, and is about 75 miles east of San Francisco Bay Area and the Napa Valley wine region. UC Davis, spanning 7,309 acres, is the largest of the ten UC campuses. UC Davis was founded in 1908, and although its mascot is the mustang, its students and alumni proudly call themselves ‘Aggies’ in honor of the school’s agricultural heritage. Check out the places of interest, parking facilities and the Arboretum using the campus map. Known for its state-of-the-art research facilities, productive laboratories and progressive spirit, UC Davis offers over 90 graduate degree programs. UC Davis faculty and students foster a culture of collaboration and provide global leadership in diverse disciplines. For more information about this world-class university see the UC Davis website. The College of Agriculture and Environmental Sciences is the second-largest college at UC Davis, with fifteen departments in Agricultural Sciences, Environmental Sciences and Human/Social Sciences. For more information see the College’s brochure. Parking. There is a $9/day fee to park on the UC Davis campus. Daily permits may be purchased at kiosks near the entrance of the parking lots. Tobacco Free. Effective January 1, 2014, no smoking or use of other tobacco products are allowed on the UC Davis campus. For additional information about transportation to the campus, restaurants, lodging options, shopping and more, please visit our Travel and Accommodations webpage.